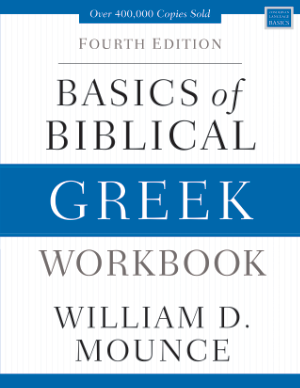 You can purchase Basics of Biblical Greek: Workbook online from ChristianBook.com or from your local bookseller. Download the Preface and Chapter 10. This text is the companion volume to The Basics of Biblical Greek. Except for the first two chapters, each chapter is broken into six sections. Parsing contains ten individual words to parse. Warm-up are short phrases that center on the grammar learned in the current chapter. Translation gives you twelve verses, usually from the New Testament (rarely from the LXX or Apostolic Fathers). I trust that by translating the Bible from the first day, you will be encouraged. Any word you don‘t know is given in the text in parentheses. The last two sentences are made-up. Additional gives you another eight sentences to translate. The first three are either made up or are from the Septuagint or Apostolic Fathers. (Sentences 11 and 12 are always madeup.) As a general rule, if you can translate these you are doing really well. If you don‘t know the word but could figure it out from its lexical form, its lexical form is given in the footnotes. If you can’t figure out the word, its meaning is given in the text in parentheses. The last five sentences are from a variety of sources, including my imagination. In sentences 16-20 you are expected to use the lexicon. If the form is too difficult, or if the word is not in the lexicon, then I either give the lexical form in footnotes (if you can figure it out from the lexical form) or the meaning in the text in parentheses. Summary covers any new grammar learned inductively in the exercises.You are encouraged to write what you have learned here in the margins of the grammar. References. The verse references to the biblical examples are listed in “References.” This is to help you not think subconsciously about the verse in English, which might happen if I list the reference with the verse. If the verse reference has a parenthesis around it, this means I altered the biblical passage a little. If there is a dash, one of my friends or I made it up. In the Appendix you will find “Track Two.” There are two different ways to work through the textbook. You can download a fuller explanation here. Track One follows the normal order of the textbook by covering all the noun system and then moving on to verbs. Track Two allows you to cover some of the verbal system earlier. The chapters in the textbook are the same; Track Two exercises are new. A fuller discussion is in the textbook, page 91. When you are done with one of the tracks, you can use the exercises in the other track for review.